Excursión privada desde Livorno a Pisa y Florencia. Viaje en un cómodo monovolumen privado en lugar de un gran autocar. 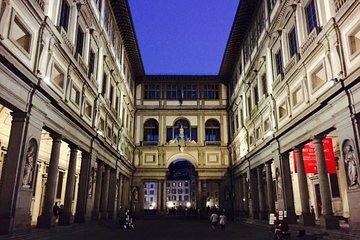 Navega por los mercados, cafés y restaurantes de Florencia para comprar comida o bebidas. This was an awesome tour and our guide was prepared with tickets for us to enter attractions/museums even if we were not. He also made recommendations for a lunch restaurant which turned out to be delicious. It was a very enjoyable day. Fantastic tour with Giovanni who was very knowledgeable and took us to see the main highlights of Pisa and Florence! His English is exceptional given that he used to live in the US. It felt like he was part of our group as we toured the cities together! Very friendly and easy-going, allowing us to do things at our own pace! Highly recommended! This tour was the highlight of our cruise.Giovani was our driver and he was great.I would recommend this tour to everyone. Recommend LuccaLimo without any hesitation. My family and I had a wonderful time touring Pisa and Florence. One day was not enough time to visit all of the historic sights, but our guide Valter, who spoke perfect English, did an awesome job to take us to as many places as possible and he provided historical context so that we were able to appreciate the places we visited. We booked a private tour which did not cost much more than a group tour, and boy, was it worth it. Thank you Valter. Mauro picked us up at the dock and we headed off for a great day. We first stopped in Pisa and saw the leaning tower, taking the usual pictures pretending to hold it up. We then traveled to Florence, making a quick stop at a small business that makes wine and olive oil. We got to see the equipment and process which was really cool. We bought a small bottle of their olive oil to bring home with us. We arrived in Florence and drove up to a high observation area that looks down over this amazing place! We spent the next couple of hours visiting the museum and the famous bridge along with doing a little shopping. Mauro was amazing and told us so many interesting things about the cities and country. This is a great way to get a lot in when you have only one day! When we our group consisted of 7 adult/young adult extended family members disembarked in Livorno our guide, Giovanni, was waiting in the terminal building. We were escorted to his spotless minivan and were quickly on our way. Giovanni learned our names and remembered them throughout the day. He spoke perfect English because he had lived in Florida for a number of years and his wife was American. Giovanni was easy to talk with, funny and informative. We went to Pisa first. He dropped us very close to the Leaning Tower and we spent about an hour absorbing the atmosphere and taking pictures. We met Giovanni where he had dropped us and were on to Florence. On our way into the city we stopped at Piazzale Michelangelo for a spectacular panoramic view of Florence. Great photo op!!! We then drove into the center of Florence. Everyone was hungry so we stopped for lunch and gelato at places Giovanni recommended. We were enjoying conversation with him and invited him to join us for lunch. After delicious pizza, salad and gelato we walked through Piazza Signoria to the Ponte Vecchio. We discussed a pick up point and time with Giovanni and we were on our own for a couple of hours of shopping and strolling through Florence. We again met up with Giovanni and arrived back to our ship without any worries. During the course of the day we were offered bottled water which we took advantage of because it was very hot and sunny. Everyone in our group thought Giovanni was awesome and we enjoyed our day in Pisa and Florence. As a note..we did not choose to climb the Tower or visit museums in Florence. I believe those options can be arranged in advance with the tour company. We are a family of 4 w/ a 4 year old and a six year old. Our guide, Giovanni, met us right at the port. From the onset he was engaging and provided us little facts about Pisa and Florence. He even engaged my very talkative son about his favorite video games and kept him entertained. He gave us enough time in Pisa and when we arrived in Florence, he dropped us off right in the center of the city where we could walk to the important sites. The only thing I wish we were given was a map of Florence. Other than that, if you have kids with you, I would recommend this private tour. It's the best way to go. Had a fantastic time our guide was excellent! This tour was amazing, as well as the guide, Lucca. He really made the trip memorable, and got us close to the sites, so we didn't waste time walking like you would on large tour busses. Lucca brought us to more locations, then offered on the site due to us running ahead of schedule.